It’s a problem when trailers do nothing to make one want to see the movie. Fortunately, the movie is much better than the trailers made it seem. The Venom parasite is an extraterrestrial organism from a comet in space. “Not-Elon-Musk”, a Silicon Valley CEO and would-be guru, sends up a spacecraft to the comet and brings back four of what is claimed to be millions of parasitic organisms on the comet. In a scene all-too-reminiscent of Rampage’s opening, the spaceship crashes to Earth (in China, of course, gotta grovel for them overseas bux) and one of the parasites escapes. The others are taken back to America, where “Also-Definitely-Not-Martin-Shkreli” throws them into one of his pharmaceutical companies’ labs, taking a break from overcharging innocents for his medicines, and also murdering the homeless in his illegal drug trials, to murder the homeless in illegal alien parasite trials. Visionary! 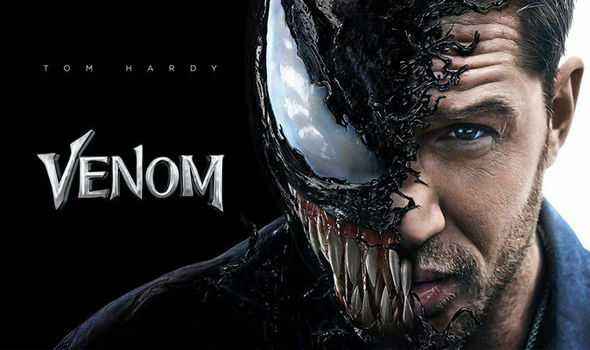 So Venom escapes and merges with Eddie Brock and he becomes a super-powered killing machine and sort of panics and Venom does some cool stuff in action scenes and chases, and the other parasites become a problem that has to be dealt with and eventually there’s a climactic battle to save the world. Venom was a comic-book character originally, first appearing as a symbiotic substitute Spider-Man suit but later becoming the over-muscled menace (designed by Todd McFarlane, natch) people know and love. In the comics, he could do any old thing, but his usual powers would be difficult or impossible to do practically, so CGI was requisite. I will say that the FX were much better than the trailers made them seem. They were, in point of fact, pretty credible most of the movie. Of course, this Venom isn’t and never was a Spider-Man suit. In fact, the white spider that normally adorns Venom’s chest is missing entirely, and there is absolutely no mention of Spider-Man or anything relating to him. (Except for one of the astronauts being named “Jameson”, which is a reference comics fans would get.) This movie seems to be utterly independent of every other Sony Spider-Man movie, and it ESPECIALLY has nothing to do with Spider-Man Homecoming and the rest of the Marvel Cinematic Universe. Venom isn’t a bad movie. I’m not as enthusiastic as the general public seems to be (31% critic, 89% audience score on Rotten Tomatoes), but it’s on track for an $80 million domestic opening weekend ($205 million worldwide). And there’s some good reasons for that. You’ll be pleased to know that Hardy turns in a credible performance, at least he has an exact characterization he’s trying for and he nails it exactly. Sure, his character is a bumbling, mush-mouthed loser, but what are you gonna do? This is not a lazily made movie. Everyone on screen is trying to take the material seriously, and they put in the effort to deliver good performances. And succeed. Sure, the movie is treading well-trod ground (cf every single “take over people’s minds” alien invasion scenario, including one from my Electric Dreams review just last week) but the action scenes are well-edited and not as bad as the usual run-of-the-mill schlock. There’s some humor and pathos mixed in, and the movie doesn’t drag its entire run time, nor is it padded, nor does it keep going on long past when it should have ended. It’s pretty tightly edited. Which, all things considered, isn’t bad.